A couple of friends in our small group took a Sushi class and threw us a Sushi party to pass on their new skills. I was kinda nervous because even when I’m NOT pregnant, I don’t eat raw fish. But Megan promised me there would be cooked fish and even chicken to choose from. First we prepped the food. You can see the fish, chicken and shrimp on the left and sliced cucumber, carrot and cream cheese on the right. I love that they had traditional items but some items that were not so scary for newbies like Doug and I. We all sat around the table with a cutting board and gloves on. The cutting board to help up move and maneuver our roll, and later to cut one. The gloves helped to keep the rice from sticking to our hands. Megan took us through the process, giving us the step by step and helpful hints. 1. Lay out your seaweed. 2. Add the rice and press to the edge of the seaweed. 3. Sprinkle sesame seeds on the rice, this keeps it from sticking to the cutting board when you flip it over. 5. Roll up by hand. 6. Use a wooden placement sheet covered with saran wrap to get the roll super tight. You can see my friend Dawn pulling towards her while holding tight to the other end of the mat. Once you have the roll, you use a knife to slice into bite size pieces. It helps to dip the knife in water before each cut to keep the food from sticking. It keeps the rolls nice and clean cut. Doug’s first roll had way too much rice. He said it was his size. Isaac enjoyed watching and chasing the dogs around the house. We were all having so much fun I lost track of time and kept him up later than we ever have. He got wild and we finally headed out. Here is my first finished roll. We had several sauces to dip into. Doug surprisingly like the wasabi mayo mix and I stuck to the classic soy sauce. Yummy! Also, Doug got to use chopsticks for the first time. Overall, it was such a blast. We have fun friends! And, I guess I like Sushi! Is it still Sushi with chicken? I think I will have to try out the new place in Hyde Park, Fusian. They have chicken too! **Disclaimer: There is a lot to know about eating raw fish. You cannot just go to Kroger and pick up fish for sushi. Please do your homework about sushi-grade fish before trying it at home. This entry was posted in recipe, Uncategorized and tagged at home, chicken, cook, group, how to, make, sushi on October 9, 2013 by projectmomma. Last week I joined 20,000 of my closest friends on a “beans and rice” fast with my church. The goal was to live on sustenance and give out of our abundance – for one week. We pooled together all the money we saved only eating rice and beans to donate to three charities. We raised a BUNCH of money (I’ll update once I am allowed to share the amount). I wasn’t sure I could eat beans and rice for breakfast, so instead I did coffee and juice. And, since Isaac has been kinda choosy with his eating, I decided to make some homemade juice that he could share. I found some recipes on Pinterest. Carrots are a great vegetable to juice. And, even thought I am not a huge carrot lover, I know they are so healthy for me. Great for my skin and vision as well as a cancer preventer. It is a great base for juice. I have often juiced apple and carrot together, but this was my first time using the granny smith apples along with ginger. This was Isaac’s first juice and he loved it! He drank it all down while riding with me to work. I wish I had given him a little more in his cup! I was really excited about trying his juice. I love lemonade and was happily surprised when left with a very tart (and still sweet from the pineapple) aftertaste. This recipe made a lot more than the first one. So, I literally was drinking it until lunch. I was full but did not want to waste any of it! Note that my lemons in this picture were large not small, which was fine with me but a little too tart for Isaac (insert cute toddler pucker face here). The next time I tried this recipe, I reduced the lemon and he liked it much more. If you are new to juicing you might not know where to start. I am definitely not an expert on juicing, but here are some of my personal opinions and tips. 1. Start with recipes that use vegetables and fruits that you already like to eat. 2. Plan on replacing a meal or a majority of a meal with the juice. Vegetable juices are much heavier and more filling than store bought fruit juices. 3. Prep all your produce before you start juicing. Prep the night before busy mornings. Make sure to wash produce before coring and cutting. 4. Drink your juice cold. This works if you juice produce straight from the fridge too. 5. Juice only enough for one day. Start fresh the next day. 6. Add sweetness (like apples or pineapples) to veggies to bring balance. 7. If you don’t love the taste, use a straw and try again. It kinda begins to grow on you. 8. When you can, drink your veggies and eat your fruits. 9. Clean your juicer right away to save scrubbers elbow. 10. Venture out and try adding new produce to the bases that you already like. 11. If you’re juicing for kids, start them young and get them involved in the process. Juicing is a great way to get nutrients into your body without having to consume the whole vegetables! Give a try. It is so good for you and you will love the natural energy! This entry was posted in kid stuff, recipe and tagged apple, carrot, celery, cucumber, ginger, juicing, lemon, pineapple, romaine, toddler, vegetable on April 4, 2013 by projectmomma. Can you tell that I have been reading too many 1 year old books? Yes? “Go, Dog, Go” is on the nightly rotation along with “Good Night Moon” and “Curious George”. But this dip is not for kids, it is for ME! Well, me and my lucky friends. It was my turn to bring the snack to small group this past week. So I turned to my favorite little recipe collection… Pinterest! I was actually searching for a St. Patty’s Day green treat, but what I found was Martha Stewart’s Spinach Dip Recipe. Yum. I have always wanted to learn to make a Spinach Dip. I get super giddy anytime I find one that I love; there may be excessive hand clapping and squealing. Maybe. I prefer more spinach, less artichoke and just the right amounts of garlic and cheese. Some great ones in Cincy, IMHO, can be found at: The Pub in Hyde Park, Bar Louie in Newport, Teller’s in Hyde Park, and Applebee’s down the road. If I could add a homemade Spin Dip to that list… life would indeed be grand! First, I prepped the spinach I have to admit this is the first time that I have cooked with fresh spinach (besides salad). I opened the first bundle and picked off the stems. It took a LONG time. By the time I got to the second bundle I used my brain and cut the stems while it was still bundled. Genius? Nope, I just needed a wee bit of experience. I washed the spinach and chopped it up, just rough chops. I added in half of the spinach and let it cook completely until wilted. Then I added this second half right on top and let that wilt down. A few stems spared the knife, but the won’t spare the sauna. Muah-ah-ah! Once it all the spinach was completely wilted down, I transferred it to a strainer and with paper towels pushed all the excess liquid out. In the empty dutch oven, I dumped the cream cheese and milk and stirred until smooth. Next, the spinach went back into the hot tub along with all the final ingredients: 1/4 cup of the mozzarella cheese, worcestershire sauce, tabasco sauce, salt and pepper. I greased a shallow baking dish with olive oil and dumped it in. I put the rest of the mozzarella cheese right on top. Quick Tip: On the top of the lid I put a sticky note with the temperature and length of time to cook. This is helpful for me and the host once I arrive at our destination. I have no “after picture” so you’ll just have to trust me… the cheese browned beautifully and my friends were happy. Husband said it needed more cheese, but he is a cheese-aholic. I loved it. This is life-changing people! At least for me. The fact that I can make my own spinach dip means I never have to leave my house again. OK, I am exaggerating just a tad… for emphasis. This entry was posted in recipe and tagged martha stewart, spinach dip on March 18, 2013 by projectmomma. Chicken Fricasse Julia Would Be Proud Of! Just another Tuesday. Time to try a new recipe! For Christmas I got Season 12 DVD and Cookbook. It is the best because you can watch the episode (over and over) before you even make it yourself. So before making this dish, I had really watched it about 10 times. Crush, I tell you. 1. Pat chicken dry with paper towels and season with 1 tsp. of salt and 1/2 tsp of pepper. Heat butter and oil in 12 in skillet over med-high heat until butter is melted. Place chicken in skillet and cook until browned, about 4 minutes. Using tongs, flip chicken and cook until browned on second side, about 4 minutes longer. Transfer chicken to plate. 2. 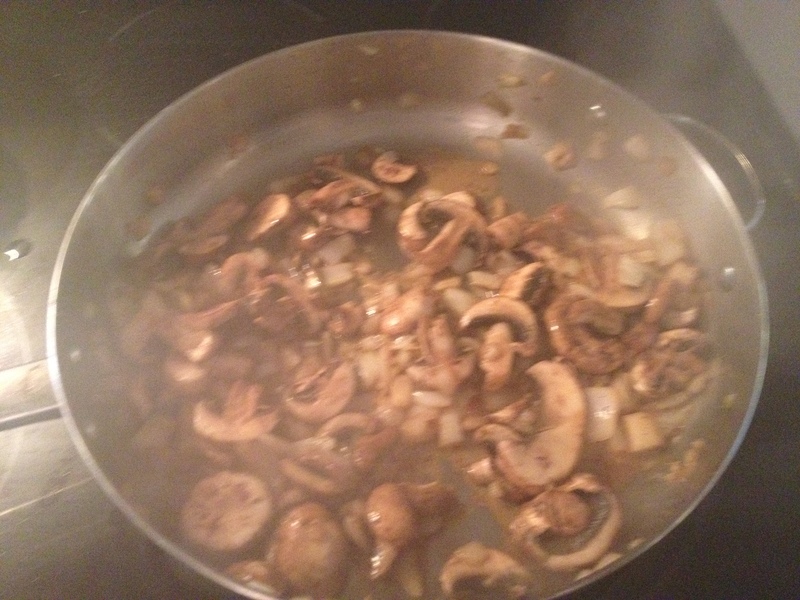 Add mushrooms, onion, wine to now-empty skillet and cook, stirring occasionally, until liquid has evaporated and mushrooms are browned, 8 to 10 minutes. Add flour and garlic; cook, stirring constantly, 1 minute. Add broth and bring mixture to boil, scraping up any browned bits. Add chicken and any accumulated juices to skillet. 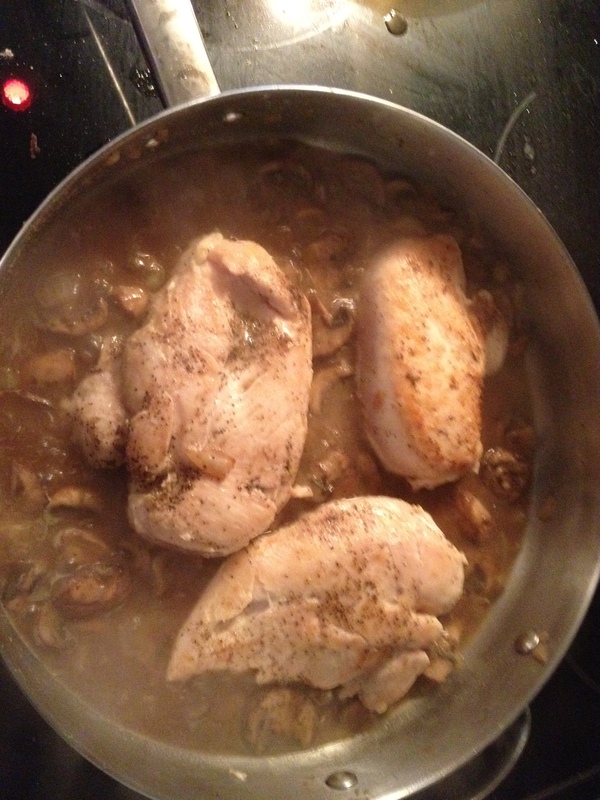 reduce heat to medium-low, cover, and simmer until breasts register 160 degrees (thighs – 175 degrees), 5 to 10 minutes. 3. Transfer chicken to clean platter and tent loosely with aluminum foil. Whisk sour cream and egg yolk together in a bowl. Whisking constantly, slowly stir 1/2 cup hot sauce into sour cream mixture to temper. Stirring constantly, slowly pour cream mixture into simmering sauce. Stir in nutmeg, lemon juice, and tarragon; return to simmer. Season with salt and pepper to taste, pour sauce over chicken, and serve. So first of all the video of this looked easy and tasty. And, it was called a “great Tuesday night meal” meaning that is was doable after a day at work. It seemed worth a try! I bought all the ingredients I needed; tarragon was the only thing that I had never cooked with. I found it near the mushrooms in the small packets of refrigerated herbs. I admit… I watched the 10 minute video one last time for a little bit of motivation. I took it step by step and it was all pretty easy and smelled delicious! 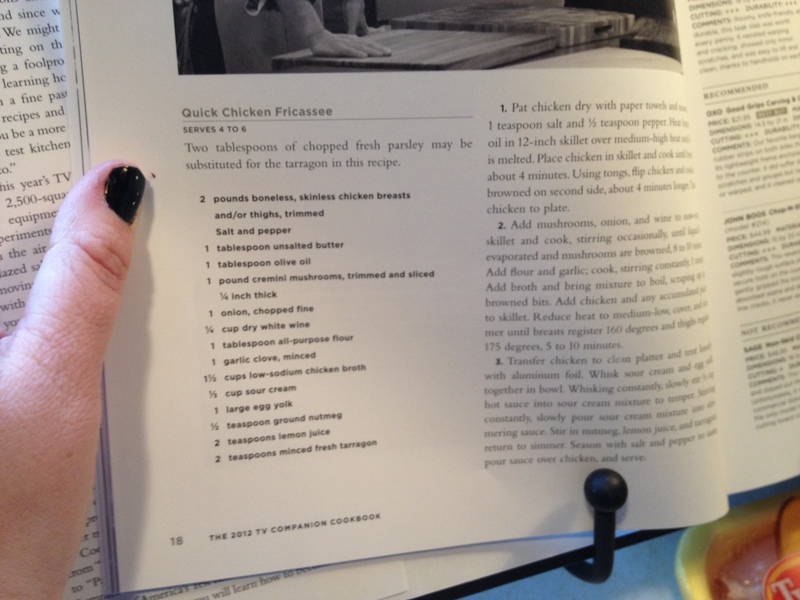 The book’s directions were simple!I whipped up some garlic mashed potatoes. The sauce paired well with them but may also taste fabulous over egg noodles. (I think I will try that next time). By the way, my husband said that it was “Excellent!” and he is a hard one to please when it comes to food. He even said, “It tastes like something would get at a restaurant! ?” I have to admit that it was one of my best ever meals. It is a new staple here in Schraeradise. 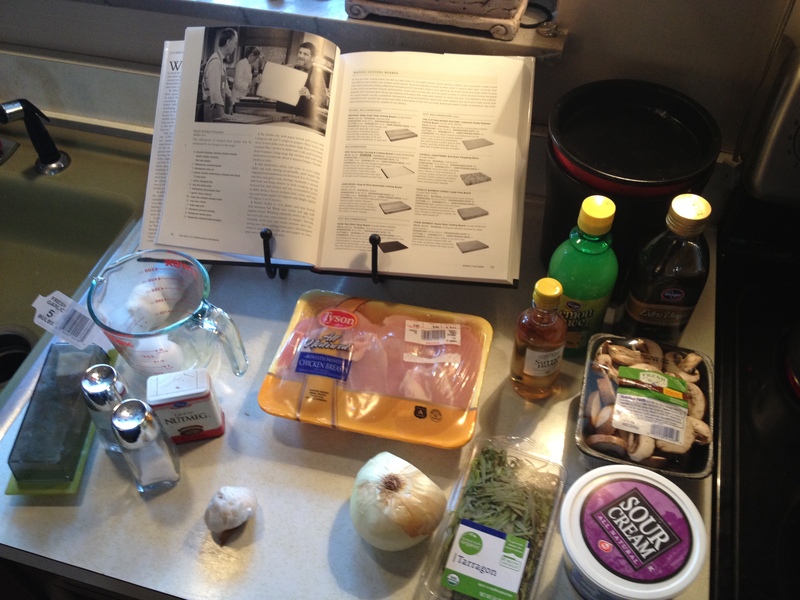 Chicken Fricasse is a french recipe and I couldn’t help but think of Julia Child while I made this. I think she would be proud. If not her than Julie her stalk-blogger would! 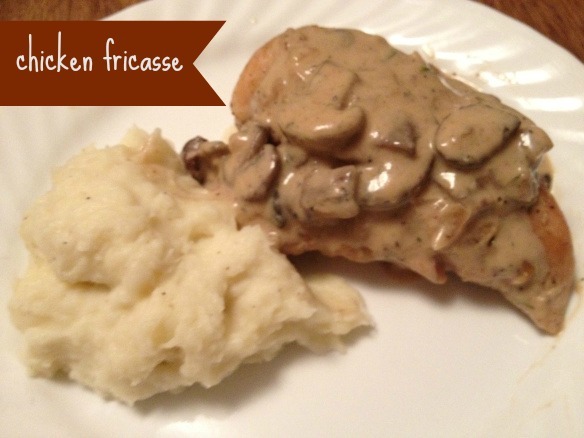 This entry was posted in recipe and tagged america's test kitchen, chicken, chicken fricasse, mushroom, tuesday night meal on January 23, 2013 by projectmomma.